Among music legends, Nile Rodgers is truly exceptional. He amplifies his legacy as a Grammy-winning composer, producer, arranger, and guitarist by constantly traversing new musical terrain and successfully expanding the boundaries of popular music. As the co-founder of CHIC, Rodgers pioneered a musical language that generated chart- topping pop hits like “Le Freak,” sparked the advent of hip-hop with “Good Times,” and won CHIC nine Rock and Roll Hall of Fame nominations. His work in the CHIC Organization and his productions for artists like David Bowie and Madonna have sold over 200 million albums and 50 million singles worldwide while his innovative, trendsetting collaborations with Daft Punk, Avicii, Disclosure, and Sam Smith reflect the vanguard of contemporary music. Fueling four decades of pop anthems with more than 200 production credits to his name, the scope of Rodgers’ peerless influence is undeniable. 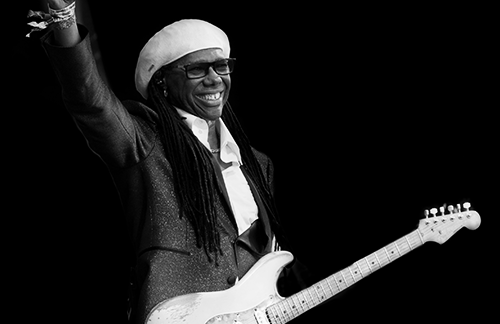 If 2015 is any indication, Nile Rodgers is about to set more precedents in his own illustrious career. While “Le Freak” will be inducted into the 2015 Grammy Hall of Fame, Rodgers will receive the President’s Merit Award during the Recording Academy’s 8th Annual Grammy Week Celebration for the Producers & Engineers Wing of NARAS. He’ll also appear on the new PBT series Speakeasy for a 60-minute interview with Valerie Simpson. Signed to Warner Bros. Records, Rodgers is currently preparing the first new CHIC album in nearly 25 years. It’s an historic undertaking that bridges two generations of CHIC, including late co-founder Bernard Edwards, drummer Tony Thompson, and Luther Vandross. The first single “I’ll Be There” is slated to drop in March 2015 and will be followed by an album release later in the year. One of the world’s most dazzling headliners, Rodgers will take CHIC on the road throughout the year and offer the keynote address at LEAF (London Electronic Arts Festival) in March 2015. However, picking up the guitar at 15 years-old forever changed the course of Nile’s life. He studied with Ted Dunbar and Billy Taylor at New York’s prestigious Jazzmobile program and even jammed with Jimi Hendrix after forming his first band, the jazz-blues- rock outfit New World Rising. Rodgers landed his first professional gig in the road show for Sesame Street and subsequently joined the Apollo Theater’s house band where he backed R&B powerhouses like Aretha Franklin, Ben E. King, Parliament-Funkadelic, and Screamin’ Jay Hawkins. During his tenure with the Big Apple Band, which accompanied R&B vocal quartet New York City in concert appearances, Rodgers struck a partnership with music director and bassist Bernard Edwards. The Big Apple Band’s blend of jazz, funk, and disco evolved into a unique style that formed the heart of CHIC, a name that Rodgers and Edwards adopted when Walter Murphy and a completely different Big Apple Band scored a number one hit with “A Fifth of Beethoven” in October 1976.